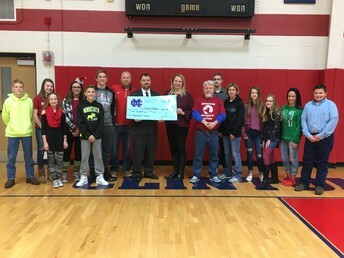 For the second year in a row, Clinton-Massie Middle School collected donations for local cancer-related charities in the spirit of No-Shave November. 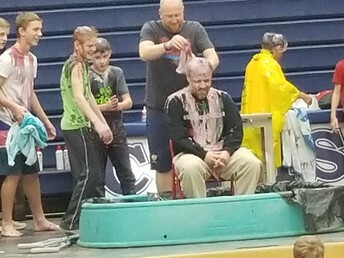 Staff members and student partners volunteered to be slimed and take pies to the face to assist in the fundraising. 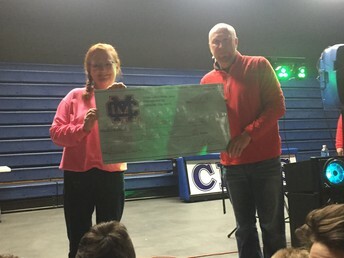 CMMS was able to donate $300 each to The Dragonfly Foundation and Pink Ribbon Girls. On December 20th CMMS held their traditional Geography Bee in front of the entire staff and student body. Preliminary rounds were held within the regular Social Studies classrooms with ten finalists competing for the title of school champion. 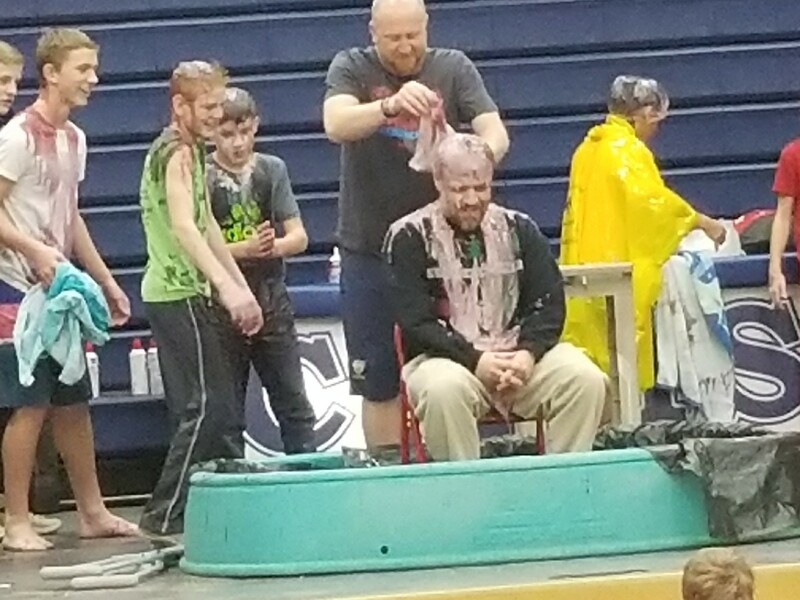 This year's winner, 7th grader Joey Kocher, was crowned after a dramatic, well-fought competition! 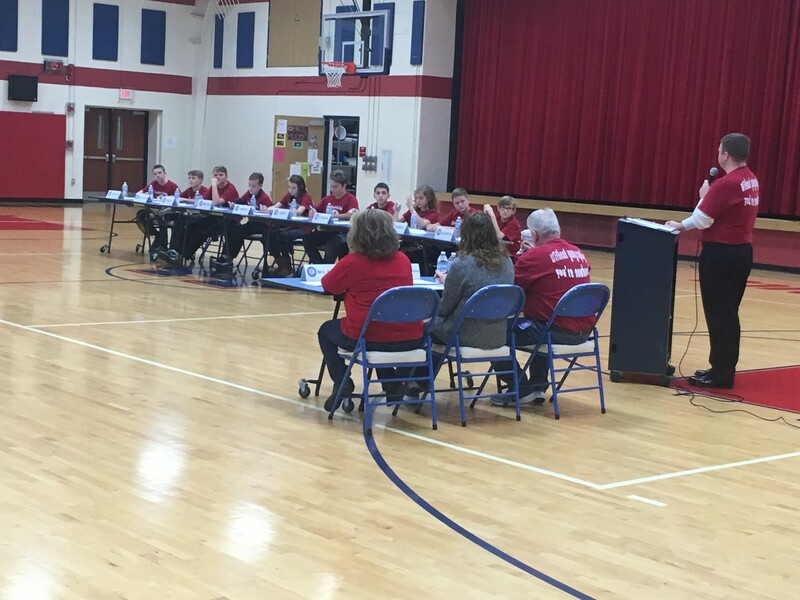 8th Grade Quiz Bowl brings home trophy! 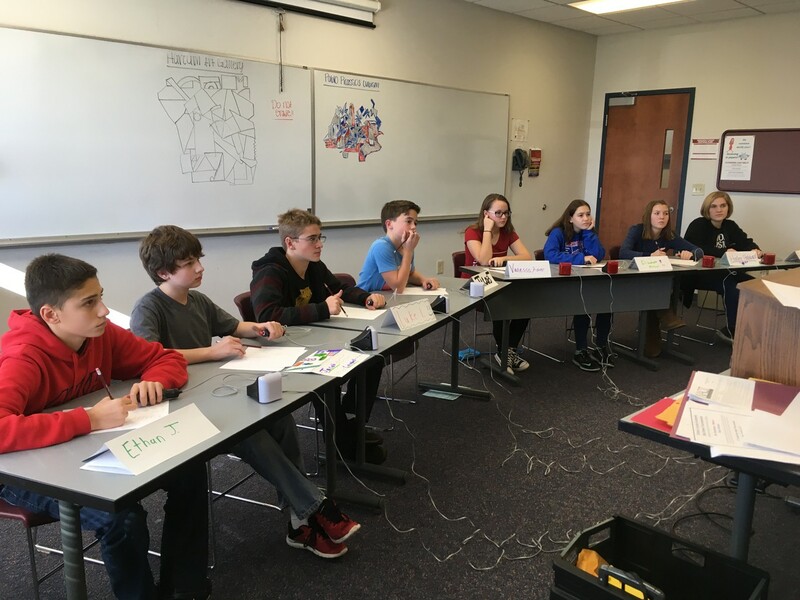 On Friday, December 1st, teams competed in a fun, cross-county tournament. 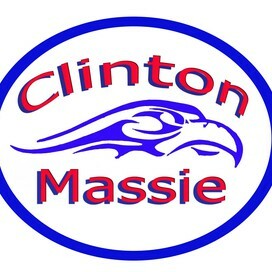 Clinton-Massie ended up with two teams in the semi-final round with Clinton-Massie taking first place. Congrats to the semi-final participants – Elizabeth, Evan, Hailey, Sarah, and Vanessa as well as our 1st place team – Jacob, Ethan, Luke, Miley, and Jacob. Way to bring home the trophy! January is the Winter Benchmark period for NWEA MAP assessments for students in grades Kindergarten through 9th grade. Clinton-Massie teachers use MAP data to help us customize instruction to meet the needs of the individual learner. The Elementary School will be MAP testing January 8 and 9. Middle School and High School will MAP test on January 16th and 17th. MAP is also used as an identifier of the Gifted Learner. Mr. Stewart grew up in Beavercreek, Ohio where he played football and sang in the Dayton Rotary Boys Choir. Later he sang and played bass in several rock bands and still enjoys recording music to this day. 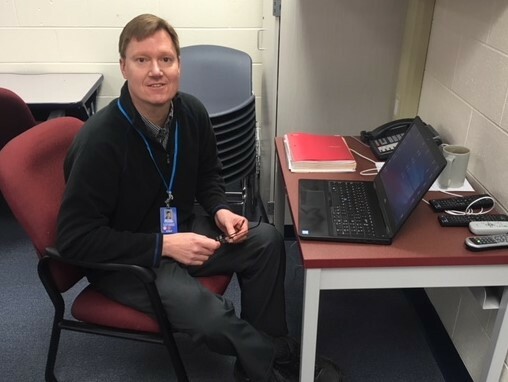 Two days after graduating from Wright State University, he began teaching summer school and remained a history teacher for the next nine years. During these years he earned Master’s degrees from The Ohio State University and Wright State University. 1) Individual Counseling to help students cope with feelings of sadness, anger, stress, etc. 2) Group Counseling for mediation, grief, and other issues. 3) Parent Contacts to help with issues of scheduling, attendance, bullying, etc. 4) Setting up and attending meetings to deal with special education issues, leadership issues for both individual grade levels and the building as a whole, parent meetings and conferences/workshops. 5) Referrals to Children’s Services, Solutions, or the Educational Service Center, as needed. 7) Scheduling and School Records. 8) Testing and make-up testing. 12) Orientation and transitioning of students who are new to the Clinton-Massie district.